Southwest Virginia Community College students taking anatomy, allied health, and administration of justice, will find the new Virtual Cadaver Lab invaluable. There are over 60,000 plus medical students who engage in cadaver dissection during a given year. Nationwide, only 17,500 cadavers are available annually. The lab will allow SWCC students the opportunity to work with an anatomically correct simulated cadaver. This is the same opportunity that students at a handful of large universities, such as Stanford, have available to them. The new Virtual Cadaver Lab at SWCC will allow our students to explore the anatomy of a human body on a scale, that until this point, was unavailable to them. SWCC students, because they will have logged time on this real-time, interactive experience will be better prepared to meet the demands of health care careers in a number of specializations. The Virtual Cadaver Lab simulation allows a student to view a human body from any angle. They can interact with the life-sized screen with a virtual probe, which even allows them to cut open the skin for exploration. 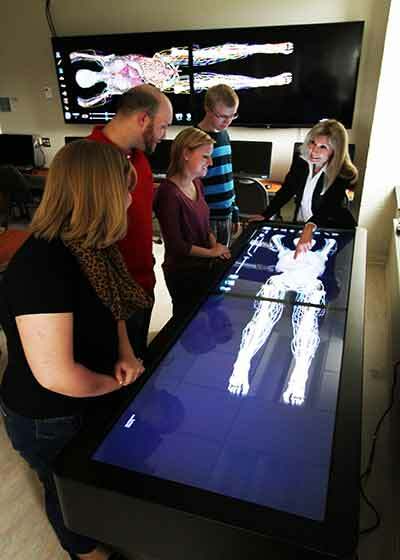 The Virtual Cadaver Lab was made possible by the Title III, Strengthening Institutions Grant.